We left the campsite around 8:15 this morning and started with an uphill. There’s nothing like dripping with sweat minutes into the day! The temperature seemed a bit cooler today, but it was still very humid. We crossed a lot of roads throughout our hike. We took a break in the morning at Old Forge Picnic Area. It was so strange that on a Sunday there was nobody at the picnic area. There were a few raindrops, but it never amounted to anything. We filled up on water and dumped our trash before moving on. Only about a mile from the park, we made an unexpected stop at Tumbling Run Shelters where there was some trail magic. A PATC maintainer and her dog, Mocha were there and she called us up for the food and drinks. There were cold Cokes and bags of Utz and Zapps. We decided that two food breaks in a mile wasn’t uncalled for at all, so we willingly stopped to chow down. 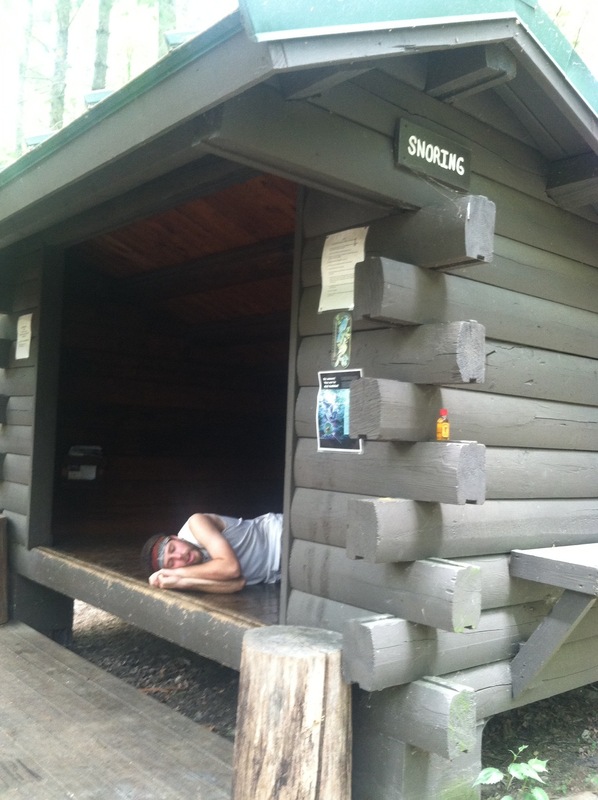 There were two shelters here: one for snorers and one for non-snorers. I had heard about them before, but I didn’t know where they were, so I’m glad that we happened upon them. And for those of you wondering, PATC stands for Potomac Appalachian Trail Club. They maintain a 240 mile section from the Shenandoahs to I believe Pine Grove Furnace State Park in Pennsylvania. The club was started by Myron Avery, a fellow Mainer in 1927, if I remember correctly. 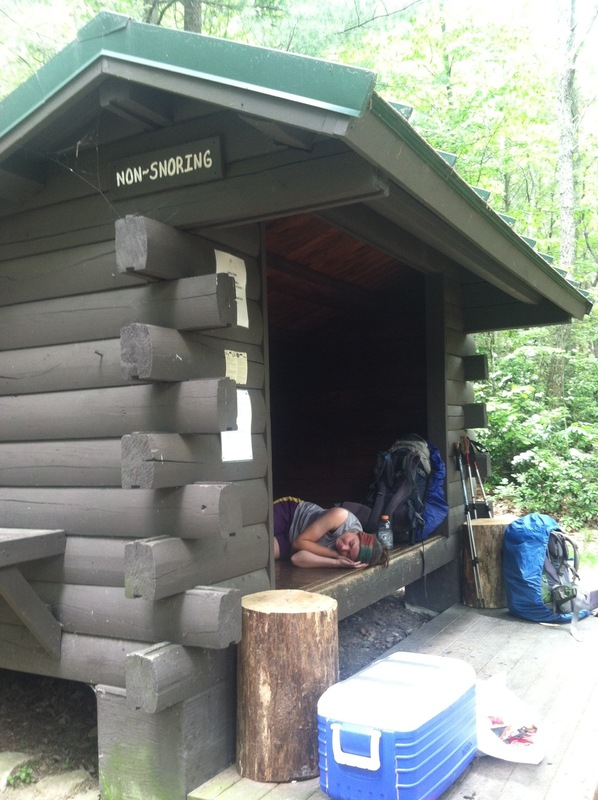 The PATC section has had some of the best shelters on the trail so far. Very clean and well taken care of by the maintainers and volunteers. We did our biggest climb of the day after our breaks and reminisced on middle school memories. Miles and I met in eighth grade, so we always have a good laugh or two when we remember the dating scene, passing notes with friends, and the fact that our school was so old, the gym had a brown tiled floor and the boys locker room also served as a fallout shelter. On our way towards Caledonia State Park, the trail became quite rocky. Welcome to Pennsylvania! We were only a couple of miles from our destination for the day, but we were starving, so we decided to stop at the park and eat under the pavilion. There was a group of families throwing an adoption shower for their friends and they talked to us about our time on the trail and offered us some watermelon before we left. They also offered us hot dogs and hamburgers later, but the sky threatened rain, so we had to decline and head on to the shelter instead. Miles stayed behind to fill up on water near the pool and I decided to head to the shelter to beat the rain. It didn’t actually end up raining, but the threat motivated me to move quicker on the uphill. There were a lot of hikers when I rolled up to the awesome shelter here. There are two 4-person shelters connected by a roof with a picnic table in the middle. There is a maintainer for the shelter, so it is very clean complete with checkers and a clothesline. Miles was taking awhile, so I began to set up and retrieve water. About twenty minutes later he arrived saying that as he was leaving, a girl at the park had a seizure, so he stayed with her as her friend went to get help. He stuck around until the ambulance came and then finished out the day. It’s a beautiful night here in southern PA and not the rainy night that I imagined. It’s supposed to be cooler this week with highs in the 70s instead of 90. One thing I forgot to mention a few days ago when we were in Harpers Ferry is that we had the chance to weigh our packs and ourselves at the ATC headquarters. To my surprise, our pack weight is about the same as it was when we started. I guess we just ended up swapping out gear for gear that weighed the same. I thought my base weight would drop down below 20 lbs. after sending home some winter gear, but it’s at about 20.5 now. I guess my pack just feels lighter because I’m more used to carrying the weight everyday. We both however have lost body weight. Miles has lost 9 pounds since the beginning of our hike and I have lost 11 pounds. I actually couldn’t believe that I had lost that much weight. I thought Miles would have lost more weight than me. The good news is that even if I do lose another 11 pounds, I will still be at a healthy weight for someone my height. That summer heat and humidity really does make you sweat off the pounds! I’ve already got some great questions from some of you, so keep them coming! We’re going to be in town in a few days where I will take the time to answer all of the questions I have received by then. On to the halfway point of the AT tomorrow and the half-gallon challenge! Enjoy the Pa. section of the AT. I have done most of this section with Boy Scout trips, so we had a lot more gear thatn you’re carrying. There are some rough streches ahead, but the boys loved crossing the Susquehanna River, and also camping at an overlook that hanggliders were jumping off. The descent to the Delaware Water Gap is also a nice walk. Enjoy PA.!! cute pics you dramatic duo! Miles, nice you’re watching out for others.